Australian Football is an incredibly fast paced, physical, and fun sport! It’s like soccer if you could hit and use your hands. It’s like rugby if there was no line of scrimmage. Don’t worry we’ll explain all the rules and skills to you. All you need is a passion for sport, competition, and a desire to learn something new and meet some great people! The San Diego Lions are an United States Australian Football League team founded in 1997 and are based in San Diego, California. 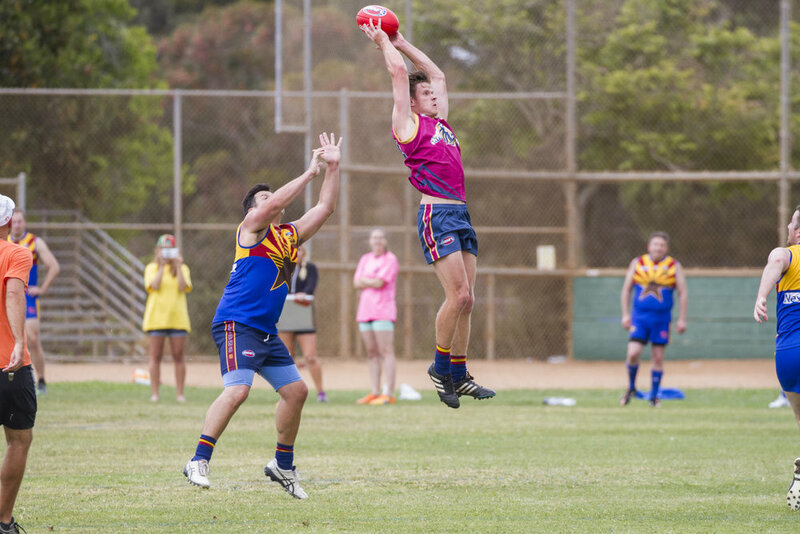 The Lions have won USAFL Division 1 premierships in 2001 and 2006 and a Division 4 premiership in 2015. The Lions are a registered 501(c)3 organization. NO EXPERIENCE REQUIRED for new players! Those who have experience in sports such as Soccer, Football, Rugby, Basketball, Tennis, and Volleyball will have skills that transfer very easily into Footy. The Lions are recruiting now, and there has never been a better time to join the club! The Lions are a 501(c)3 organization and appreciate all support from the community! Donations and sponsorships go to purchase equipment like jumpers, footballs, water, pay for field permits etc., and provide umpires for games and the general running expenses of the club. Thank you for your support!